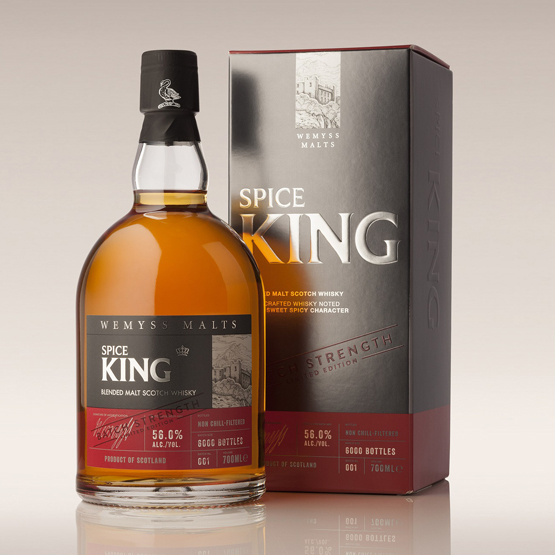 Here we go with another belter, a high strength Blended Malt from Wemyss, those clever blenders have taken ten malts from the Highlands and Islands and given us a bruiser of a dram coming in at 56% non chill filtered and limited to 6000 bottles which is stretching the term limited a wee bit but I’ll cut them some slack as it’s a nice dram. Thanks to Wemyss and Steve at the Whisky Wire for a sample, I have since bought a bottle which I bought from the Kingsbarns Website. As always I took this with a drop of water, but not much. Nose. Leather and smoke, although the smoke is a back note it’s still very much there, I detect some good age here although no age is mentioned on the bottle, salt and black pepper crisps, there is a some spiced and rum soaked fruit trying to break through and it does if you leave it in the glass for a bit, pipe tobacco too, nutmeg and grapefruit. Palate. The salt and pepper crisps are here, peat smoke and it’s a bit younger than the nose suggests but it’s still good quality, the rum soaked fruits have turned into sherry soaked fruits with some orange rind cystalised ginger and barely sweets. Finished, Decent finish leaving some of that pipe tobacco but with added honey and a nuttiness that’s very pleasant. This is an excellent dram and well worth picking up if you can and it is still available at the time of writing from the KingsbarnsWebsite.